Educational Qualification: Candidates should have passed Graduation from a recognized board/university with Relevant Experience. Application Fee: General/OBC candidates have to pay Rs. 600/- as exam fee and SC/ST candidates have to pay Rs. 100/- as exam fee through online by using Debit Cards (RuPay/ Visa/ MasterCard/ Maestro), Credit Cards, Internet Banking, IMPS, Cash Cards/ Mobile Wallet). 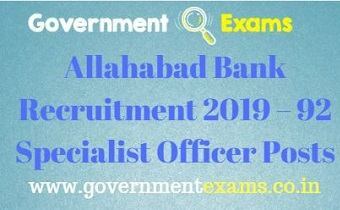 Click here to view official notification: Allahabad Bank Recruitment 2019 official notification. Click here for online registration: Allahabad Bank Recruitment 2019 online registration.